WHAT IS THE CONNECTION BETWEEN PEDOPHILIA AND A.I. (ARTIFICIAL INTELLIGENCE)? You know this op is serious when the Drudge Report gives it so much space. Now read the exposé below the screenshot to understand why. Can you imagine the American people electing a gay male POTUS who lives in the White House with a “First Man”? 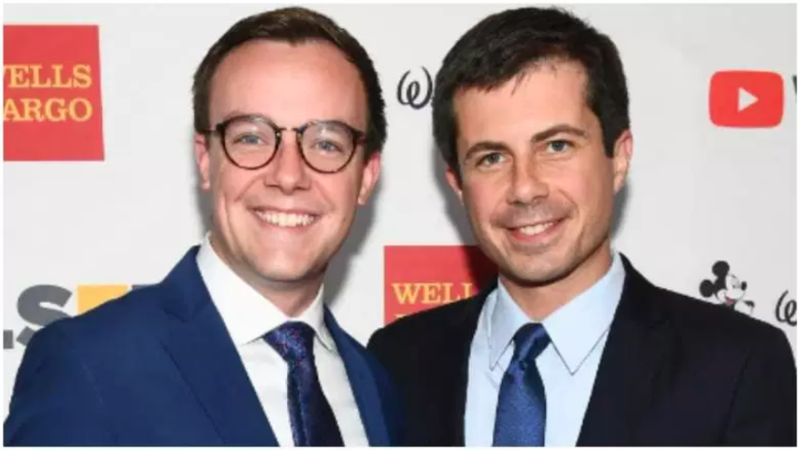 Just when you thought things could not get any crazier in 2019, along comes the gay mayor of South Bend, Indiana, who is married to a man, and who is running for the President of the United States of America in 2020. SOTN Editor’s Note: A while back we were reading another shockingly stupid piece at the premier organ of propaganda and disinformation of the CIA’s Mockingbird Media — The Washington Post — about Democrat candidate Beto O’Rourke. Reading the comments posted under the article, however, one would have thought the absurd puff piece about Beto was about another obscure Democrat candidate—Pete Buttigieg. Really, how does that happen except by purposeful design—cultural marxist design?! Every other comment was literally extolling the liberal godhood of this mayor of South Bend; some even calling him the ‘only hope’ against the invincible Donald Trump. With this critical understanding, it’s much easier to see how the cultural marxists are wresting control of the 2020 Democrat narrative to normalize a gay married man running for POTUS. Whether Pete Buttigieg really has a chance of being nominated does not even matter to the New World Order globalist cabal. All they care about is wrecking American society anyway they can. And they know that nothing does that better than aggressively promoting the LGBT agenda. Can you imagine a similar situation in Great Britain — “I now announce you King and Queen” where the “Queen” really is a queen, but not the kind of queen we read about in the history books. This queen is really a man who calls himself a queen. Wow! Just WOW ! ! ! Lest the reader fail to comprehend just how serious this plot to hijack the 2020 U.S. POTUS election cycle is, please consider this recent headline on CNN (also known as the Communist News Network). And you thought the UK had problems with Brexit. The USA has been undergoing its own version of Wrexit—24/7— for many years now. And nothing will stop the Wrexiteers until the treasonous cultural marxists have accomplished the complete destruction of American society. Really, what better way for the globalists to sow seeds of societal chaos and destruction than by putting two men in the White House. Truly, that’s their primary goal because only then can the globalists swoop in and impose their tyrannical totalitarian technocracy upon the American Republic…with very little resistance because of the fastidiously manufactured pandemonium over decades. 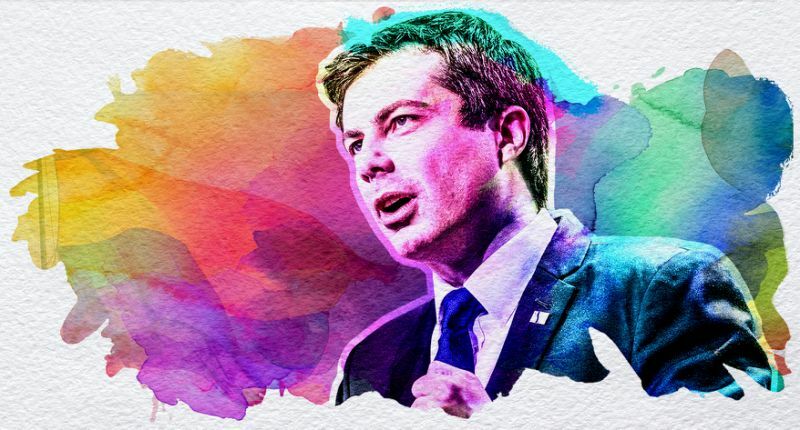 They’re even portraying Buttigieg with his own LGBT rainbow color scheme like they depicted Obama with his communist colors. You have to admit even his name somehow reflects a dire aspect of the rapidly emerging cultural marxist reality in America today. But who is this guy really? To advocate such a highly flawed measure as electoral collage abolition, which was specifically put into place by the Founding Fathers to ensure that the Sodom and Gomorrahs of the nation like New York and California, respectively, did not choose the POTUS, reeks of cynical self-aggrandizement. As for his politics, Buttigieg aligns closely with all the other socialist Democrats who are hellbent on giving away the whole store to illegal aliens at the expense of U.S. citizens. As mayor of South Bend, Indiana, Buttigieg has already shown the will to turn his hometown into a sanctuary city before converting all of Hoosier country into a sanctuary state. However, it’s his aggressive promotion of the LGBTQ agenda that distinguishes Buttigieg from even his ultra-liberal, hyper-progressive Democrat competitors. This is where his globalist masters are using him to advance the cultural marxist agenda like no other presidential candidate in U.S. history…except maybe Obama. 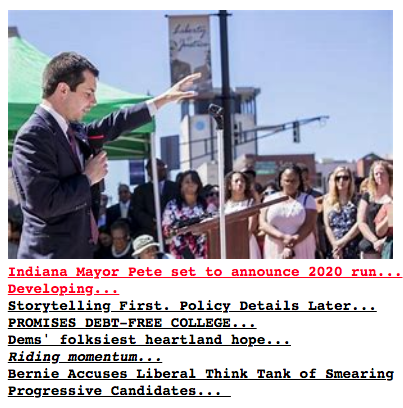 KEY POINT: The $64,000 question about Pete B is: How does a gay mayor of a small city come out of nowhere and already the liberal talking heads are analyzing How Pete Buttigieg Could Win The 2020 Democratic Nomination. 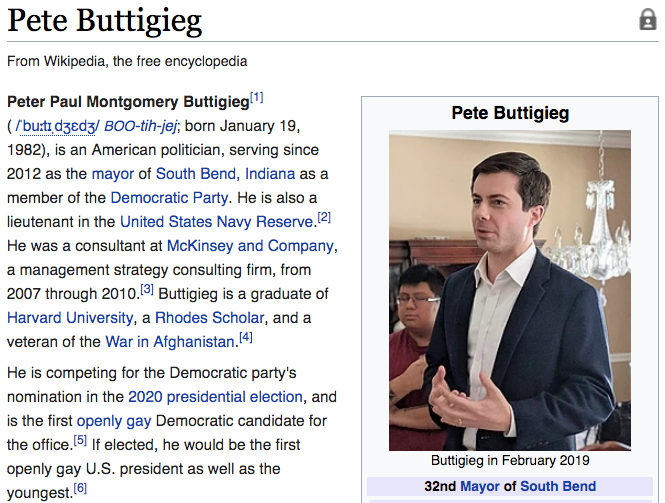 Of course, Buttigieg’s Wikipedia page (see graphic above) is full of all kinds of clues that point to his serious grounding in globalism. Not only did he graduate from liberal Harvard University, he did his globalist training as a Rhodes Scholar at Oxford just like Bill Clinton. It’s also important to note that BOTH of his parents were professors at Notre Dame University, a breeding ground for all sorts of globalist power-players in the USA and abroad. By the way, who doesn’t know by now that McKinsey and Company is a major C.I.A. contractor that’s deeply involved in all types of sordid psyops and white collar black ops? Not only that, but this 37-year-old greenhorn also did his tour of duty in Afghanistan after being commissioned as a Naval Intelligence Officer. Why would any officer but a globalist-in-training one ever participate in such a patently illegal and unprovoked war of aggression? KEY POINT: Really, what 37-year-old wakes up one day and decides to run for POTUS? Exactly, they don’t, especially in out-of-control 2019. Unless, of course, they are programmed (via Tavistock) and ordered to by their C.I.A. handlers to run. This whole choreographed Democrat wacko-drama is yet another British attempt to surreptitiously take over the POTUS by stealth just like they did with Obama. Hence, we are witnessing the latest real conspiracy associated with CROWNGATE: THE GREATEST CRIMINAL CONSPIRACY IN U.S. HISTORY. First, it’s of paramount importance to know that the Democrat Party got away with massive election theft during the 2018 midterms throughout the country. They literally stole every election in sight and got away with it scot-free. Yes, they got caught in Florida, but Florida’s always different. Secondly, it’s equally important to realize that nothing has been done to fix this extremely serious problem. And, that the election system is more vulnerable than ever to being manipulated just as the electoral process is very easily rigged. Hacking the voting and tabulating equipment is as easy as ever. Now fast forward to 2020: It’s clear that the Democrats intend on nominating a candidate who really galvanizes the electorate–both sides. (Obviously the Republicans and real conservatives will not be taken in but the DNC will try very hard.) That individual will be anointed because of their ability to rebuild the Obamanation to the extent that Trump has knocked it down, as it deserved to be. With this background, it should be easy to see how a Buttigieg candidacy could energize the liberal base as well as excite the left-wing fringe. As long as he is able to motivate a high level of participation at the polls on November 3, 2020, the stage will be set for an outright election theft. This particular dynamic is essential to the Democrats plausibly getting away with yet another stolen election. Because of what’s truly at stake in 2020, all eyes will be on every angle of this election. The POTUS winner will dictate the future of this nation even more profoundly than 2016, and that one has precipitated a HUGE shift due to the highly consequential outcomes associated with Trump’s victory. For these and many other reasons, it’s clear that the DEMs are setting up the political battlefield to steal an election that they simply cannot win fairly. Toward that end, they are quite deliberately fielding fresh candidates like O’Rourke and Buttigieg to explain an otherwise highly improbable victory. It’s critical to understand that TPTB quite likely have no intention of shoehorning Buttigieg into the Oval Office like they did the closet-gay Barack Obama. Rather, their primary purpose of showcasing his candidacy is to further normalize gay marriage and homosexuals in positions of leadership throughout the US government and Corporate America. In so doing, these elected officials and corporate officers such as CEO Tim Cook at APPLE are quite easily manipulated by their cultural marxist masters who completely control them. Each of these governmental and corporate leaders has a specific mission within the overall game plan of Cultural Marxism, as seen by Cook’s zealous advocacy of the LGBT agenda at APPLE and throughout Big Tech. And that agenda ain’t good at all for the American people. This fundamentally subversive communist plot is being insidiously advanced with candidacies like Peter Buttigieg. He is a classic Manchurian Candidate whose mission is quite similar to Obama’s, only it’s likely the Obamanation ON SUPER STEROIDS. In other words, this guy and his husband handler are every bit the crisis actors similar to the likes of Alexandria Ocaio- Cortez. Yes, that’s exactly what we’re dealing with—another Soros-funded psyop designed to further collapse the American Republic in order to establish a One World Government…after the formation of the North American Union. Now we know why so many commenters at that WAPO article were singing the praise of Buttigieg’s like he was the “Second Coming”… … … of Barack Hussein Obama only white.